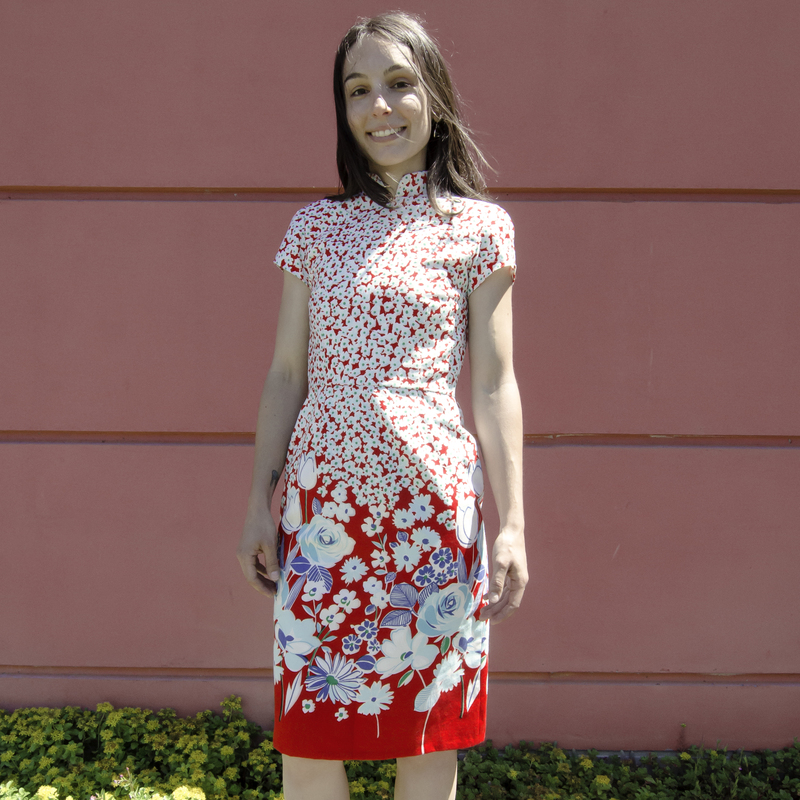 One day, Amandine told me she had been checking my blog and happened upon this dress. She asked if I might make a similar one for her. I was all too happy to oblige! What immediately came to mind was a beautiful 1960’s fabric that I had been saving for something special. I had a limited amount of fabric, so when Amandine’s dress project came up, I realized this would be the perfect occasion. I’m so happy to see this piece of vintage fabric turned into a lovely dress worn by my friend… and I feel good about using 99% of it in the making! It took a couple muslins to get the right fit, and I encountered some challenges trying to achieve a tight bodice with cap sleeves that still had lots of arm movement ease. But thanks to some gussets at the underarms (Gertie wrote a great underarm gusset tutorial) and Amandine’s patience while I was figuring things out, it worked! I also exaggerated the Mandarin collar a bit and love how it turned out. Wow!!! That fit is beautiful and that fabric/print placement is just gorgeous. This is such a beautiful dress. Basically what Natalie said ^^..I was just about to type an identical comment. 😁 Gorgeousness!! So lovely, and how generous of you to make something so special for your friend!